Other Physical Features: The large paper (22.8x14 cm, demy octavo) edition of 25 subscribed copies is printed on Whatman's handmade paper. It is bound in blue grey paper boards with white backing, and with a white label on the back with title information. Fredeman, “A Shadow of Dante”. Gregory, Life and Works of DGR , 92-93. Lewis, Rossetti's Ballads and Sonnetts and Poems (Includes a Note by William E. Fredeman). Wise, Library of John Henry Wrenn, vol. 4. The impulse to bring out a new edition of his poetry probably began in late July 1879, when DGR read T. Hall Caine's lecture on his writing in the text printed in New Monthly Magazine (4th series, I, July 1879). At that time DGR wrote to Jane Morris about his satisfaction that Caine was “enforcing my poetic claims” (Bryson and Troxell 105). Later in the fall he began to make revisions to “ Sister Helen” (Bryson and Troxell 124-126). He was preoccupied with his painting work for the next year, but when J. A. Noble praised DGR as England's finest living writer of sonnets (in an article on the sonnet in the Contemporary Review of August, 1880), the poet wrote to Caine that he was “very proud to think that after my small and solitary book has been a good many years published and several out of print, it yet meets with such ardent upholdings by young and sincere men” like Caine and Caine's friend Noble (letter to Caine, quoted in Lewis 203). By December 1879, according to WMR, DGR was seriously planning a new edition of his poetry, including “all his poems subsequently composed [to the 1870 volume], forming probably at least half as much again” (Fredeman, 226). The amount of poetry he had written since the 1870 volume was considerable, and he would augment it further as his publication plans moved forward. At first he contemplated a single new volume, and in December 1880 this was still his plan; the book was “to be called Poems Old and New” (Fredeman, Correspondence , 80.386). As the contents grew DGR was compelled to plan two volumes instead of one. The new materials and the contents of the 1870 volume were dispersed into the new edition of the Poems and its companion volume, Ballads and Sonnets . The poet came to this decision in January 1881 (see Fredeman, Correspondence , 81.35), and for the next few months he imagined several schemes for organizing the material for the two volumes. The basic form of the books was settled by early May, but publication was delayed for various reasons: the poet's ill health, the publisher's desire for an opportune commercial moment to appear in print, and Jane Morris's apprehensions about the personal cast of the poems in “ The House of Life” especially. Poems. A New Edition did not appear until 10 November, about three weeks after the first edition of the Ballads and Sonnets . As with all his books, this volume gathers together work that DGR had accumulated over a number of years. The book's subtitle indicates the general character of the volume, which is a kind of augmented edition of the 1870 Poems . But a major part of the latter, “ The House of Life” sonnets is removed from this book and transferred to the companion Ballads and Sonnets volume, which contains the major share of new writing that DGR had done between 1870 and 1881. This volume does contain some new work, however. The major new piece is the fragmentary narrative “ The Bride's Prelude”; other notable additions include “ Down Stream” and the translation “ Francesca da Rimini (Dante)”. The most important difference from the 1870 volume, however, is the re-arrangement of the contents. The removal of “ The House of Life”, as well as the reconstruction of that sequence, broke up the 1870 volume's organization. The 1881 and the 1870 volumes share only the initial Poems section, and even that is markedly different in the two books. This process began in October 1880 when DGR wrote some new passages for “ Sister Helen.” By January 1881 he had decided that he would have to put his work in two volumes (see Fredeman, Correspondence , 81.35), and he continued working at the revisions into May, when he completed his initial correction of the proofs. Work on the latter occupied DGR for much of April and the major part of the proofing was not finished until July. Most of DGR's time was spent on the poetry that would appear in the Ballads and Sonnets volume, however, not the New Edition of the Poems. He was entirely recasting “ The House of Life” and writing as well the new long ballads, and these projects focused most of his energies, as his letters of the period show. In fact, the first proofs he received were for the Ballads and Sonnets volume (in early April), and he appears not to have seen the proofs for the Poems until May, although he sent his printer's copy for the volume in mid-April (see Fredeman, Correspondence , 81.158). The printer for this volume was Strangeways and Sons, the same who printed the 1870 Poems . One wants to note this because the printer for the companion Ballads and Sonnets was Whittingham, the Chiswick Press printer. DGR's publisher Ellis probably divided the work in order to speed up the process, for Whittingham appears to have been slower with the proofs than Ellis (or DGR) liked (see Fredeman, Correspondence , 81.200, 81.204). The printing and revising continued into June for both volumes, as well as the arrangements being made to have Roberts Brothers, in America, take sheets for the two books. Although both volumes were ready to appear in late June or early July, Jane Morris' apprehensions with the personal aspects of the Ballads and Sonnets volume forced a delay in the final publication plans, as well as some late textual changes to the latter book. Since DGR wanted the Poems volume to appear after the Ballads and Sonnets , the delay over the latter forced the delay in publishing the former as well. When Jane Morris's views were finally accommodated, which appears to have happened by early July, DGR's publisher Ellis advised yet a further delay in publication, until the fall, when the market for the books would be better. 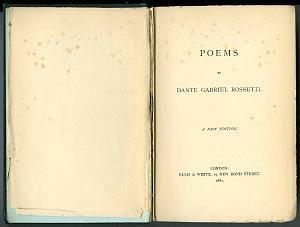 The Poems volume appeared on 10 November. The price was 12s. Although the surviving proofs (at Delaware) are not date stamped, as were the Whittingham proofs for the Ballads and Sonnets volume, a general picture of their printing schedule is clear: 9 May: initial slip proofs (for “ The Bride's Prelude”); 15-22 May: all signatures (sent in three separate batches); 23-24 May: late proof corrections, book ready for printing off; 4-17 June: book being printed off (after some final small proof corrections); 26 July: receives a complete copy from Ellis, notices fallen type to be corrected); 10 November: publication. The book's literary character is not much different from the 1870 Poems , of which it represents a slightly abbreviated revision. The reviews, as with the 1870 Poems were largely favorable, although the Edinburgh Review, the British Quarterly, and the Contemporary Review all continued to find fault along the same lines laid down earlier by Buchanan.